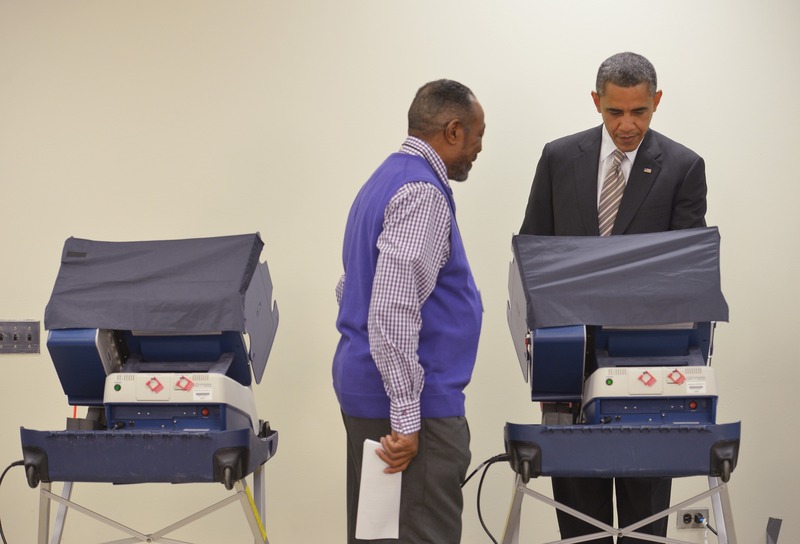 President Obama is now the first sitting president to vote early. And he made a point to note that fact at his polling place in his hometown of Chicago Thursday. "So this is the first time a president has ever early voted," he told election officials as his election paperwork was verified, "it's pretty exciting." Mr. Obama would not divulge who he voted for in the presidential race, though it's safe to assume it wasn't Mitt Romney. He told those gathered to see him vote and election officials that "it's good to be home." When asked for his identification upon arrival, the president joked, "I've got my driver's license here, now ignore the fact that there's no gray hair in that picture." An election official responded, "the presidency does something to you." "It does," Mr. Obama said. He remarked that he was glad he renewed his driver's license, adding that if he had come prepared with the wrong paperwork, the experience would have been "really embarrassing." The president spent several minutes voting. When he finished, was helped by an official whose phone happened to ring. "Is that your wife?" the president asked, "because you always take that phone call no matter what." Before leaving, Mr. Obama took a photo with the polling officials and made an appeal to the public. "For all of you who have not yet early voted," he said, "I just want everybody to see what an incredibly efficient process this was."